When looking at adult incontinence let’s be brave and ask the big question: is there a correlation between excess weight and urinary incontinence? Based on the BMI index, medical research shows that overweight and obese people have a significantly higher prevalence of adult incontinence than those with a normal BMI index. Plus, obesity is considered to be the most important risk factor for daily urinary incontinence compared to any other factors, according to the studies and the articles released by News Medical (Obesity and Urinary Incontinence by Dr Ananya Mandal, MD). This is all serious stuff, which points in the direction that there is a correlation between excess weight and adult incontinence. There’s an increasing acceptance of the valuable role incontinence products now play in the lives of many adults and a corresponding rise in pressure for products that offer exceptional comfort and fit, as well as great performance. In a report called “From Shame to Fame: Adult Incontinence Continues its Global Advance” it comments that in 2014, retail sales of incontinence products registered growth of 8 percent in volume terms and 6 percent in constant value (US$2014 fixed exchange rate), to exceed US$7 billion. The pace of growth is double that of overall retail hygiene products as consumers warm to the idea of incontinence products. Governments and healthcare professionals are seeking new ways to tackle the issue of obesity - improved fitness, health and nutrition education are high on the agenda – but with mounting cost pressures on healthcare systems, incontinence care programs are likely to fall short of demand pushing many consumers to purchase retail absorbent hygiene products to manage adult incontinence instead. People come in all shapes and sizes so retail outlets must ensure sufficient supplies of incontinence pads and hygiene products in large sizes, suitable for use by overweight and obese incontinence sufferers. Consumer reviews often point out that large product sizes are difficult to find. Other reviews also discuss how some of the incontinence care products are difficult or even impossible to use effectively when a person is obese. Weight can be carried in different areas of the body depending on genetics. 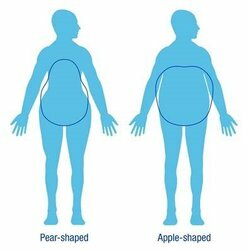 Some may carry it around their waist giving the effect of an apple shaped profile, while others may carry it lower in their hips and thighs giving the effect of a pear shaped profile. A large hygiene product size will fit these two body shapes very differently and may be a factor for consumer frustration on fit and comfort of absorbent incontinence care. Did you know that our new Conforma stretchable adhesive adapts comfortably to a world of individual shapes and sizes? This state-of-the-art industrial adhesive has unique stretchable features and is applied with standard hot melt equipment. When paired with an extensible nonwoven material it creates a conformable fabric that hugs the curves of the body. Conforma solves many issues with incontinence products by offering exceptional comfort, performance, and cost-effectiveness and can address some of these fit and comfort challenges that our industry faces today with incontinence pads and absorbent product design. Pretty cool right? Every day at H.B. Fuller, we look at the ‘serious stuff’ and ask the big questions. And, because we are thinkers and doers, we create ‘cool stuff’ like Conforma – adhesive solutions that help our customers deliver the things that matter to people all over the world. If you want to discover more about these market challenges and how Conforma can help, click this link to hear a recent presentation given by Kristy Beckman, our director of technology for global hygiene, at Hygienix 2016 on this topic.